Fiverr is an extremely popular micro-gig site. Thousands of people have created regular income for themselves by using Fiverr as a platform for offering their services. The idea behind Fiverr is very simple — what will you do for five dollars? Offer that on their site and let someone pay you to get it done. The catch of course is that you don't really get five dollars for the services you offer since Fiverr does take a cut of your earnings. You can read more details on that here in my review of Fiverr. So really you need to ask yourself what you would do for three dollars and some change since I believe that's roughly what it works out to. 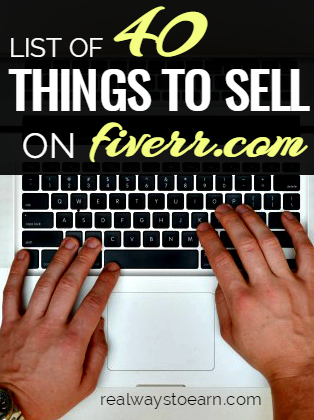 So what can you sell on Fiverr? This goes without saying, but before deciding what services to offer, make sure the pay is worth your time. I see a lot of people on Fiverr offering services that I am amazed they are willing to do for such low pay. But it all depends on how long it takes you to do something. Fiverr is definitely the most popular site of this type, but if you want to earn more money for offering any of the services above, you do have other options. Here is a list of more “post a gig” sites. Some of these are based around another dollar amount (like Tenrr) and some allow you to charge whatever you want. So now you're on Fiverr … how do you become successful? If you don't own a Kindle, you can still read these on your computer using Amazon's cloud reader. Do you use Fiverr? What services do you sell? Is the money worth the time spent for you? These days, Fiverr is better for the sellers than it is for the buyers. Established sellers can utilize gig extras to earn more for their time, quality and delivery speed. For buyers, it’s difficult to find quality $5 gigs anymore as the sellers only offer (very) basic services at this price. Before becoming a seller, think about what you plan to do and how much time it will take you to properly complete the task, so you know if you are being adequately compensated for your services. I am a level one top seller on Fiverr and I have had some decent success with making money with it. I like how you can work a gig and decide when you want to pay yourself when your revenues clear. It’s kind of nice having that little emergency stash available. I recently wrote an article on my blog about how Fiverr makes good business sense. For the longest time I’ve been trying to figure out what sells and what doesn’t on Fiverr. Positive reviews are one thing, but it’s not the same if you have 200 positive reviews over a year or over a month. Since they don’t offer proper analytics, I’ve started my own little data mining project, and so far it looks like creating logos for companies is a big hit. Well, personally I find it the easiest to start making money quickly on Fiverr by providing a service that is in high demand, such as video testimonials. These days video testimonials are all the rage and if you’re not extremely shy in front of a camera, you can certainly start making some money by investing in a decent quality camera. And pretty much that’s it! Just follow your intuition and have fun doing it, and understand that at the beginning you’re not gonna be making a lot of money shooting videos of yourself, but if you look at the ones on Fiverr that have 2000 plus positive reviews, you know that there is serious money to be made if you persist, which is what I’m aiming to do.. so far I’ve got about 10 but I’m optimistic that through hard work and dedication I’ll be driving the numbers up steadily.. I have found once you become a level 1 seller you can make a good bit more money. This is done through gig extras! I have been a seller for only a month and half or so, but I am very happy with my progress so far. It’s great when you start getting those sales on Fiverr but remember too that gig extras are the key to making good money on Fiverr. You need to go from making a measly $4 to $12 or $16 with every sale and you do this by creating gigs that are stripped down and encourage buyers to buy the extras. This will help boost your hourly rate on Fiverr! I’ve played around on Fiverr for a couple of years but have been getting more serious the last few weeks – and it actually is possible to make a significant amount from this website! Of course, as you’ve mentioned, it’s important to be smart about what you are doing and avoid jobs that take you too long. However, if you can find some worthwhile tasks, it’s amazing how much money you can make! I’ve been sharing some of what I learn on http://www.fiverrdaily.com – check it out and let me know what you think! Great ideas! I’ve found myself spending more and more time on Fiverr these past few weeks and it definitely pays off. Another thing to try, just browse the gigs already offered and offer them yourself. Just spice them up or offer them in your area if they are location based. Great tips, Claudia! Thank you! I love Fiverr too and have had some success with it. I buy and sell and I actually offer some gigs just for new writers. I like that you added eBooks on the subject. Nice touch! Yes! I love Fiverr too. When I began offering design services online I used Fiverr and it gave me a lot of experience and some great relationships too. Awesome list! Gave me a few ideas! Thanks for sharing! I so love Fiverr. I make a nice side income there each month and at a darn good hourly rate (the money is in the upsell). Connie’s book (How I Made an Extra $1,200…) was a game-changer for me.